NEW ITEM! 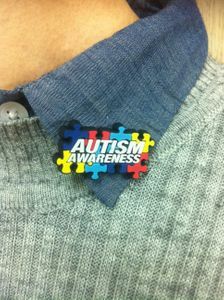 This new autism pin is our own exclusive design. It measures 1" high and 1 1/2" wide. It is lightweight, has raised letters and is made of soft PVC material. It easily secures to your clothes by a standard butterfly clasp. The bright puzzle pieces and the white lettering lets everyone know to be aware of autism.